Would Genesis Gold® help my friend with heat stroke induced hypothalamic dysfunction since childhood? Yes, I believe so. But since your one friend’s hypothalamus was damaged in childhood, it will take time for complete rejuvenation. Your friend may experience a decrease in the intensity of the migraines as well as the frequency before her body temperature stabilizes over the next 6-9 months. To hasten the response, I would recommend adding the Sacred Seven® amino acids to the Genesis Gold®. Although the Sacred Seven® amino acids are in Genesis Gold®, the extra dose will heal the hypothalamus much more rapidly. A young man with a severe head injury resulting in brain damage was given the Sacred Seven® amino acids via his gastric tube feeding, in hopes of healing him more quickly than conventional medical treatments. His neurologists were impressed at the effect of the Sacred Seven® in stabilizing his body temperature. 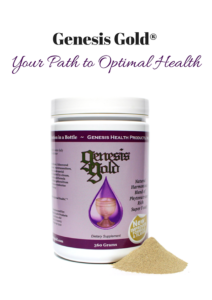 Genesis Gold® will provide the balance of nutrients necessary to reverse years of damage, by helping the body detoxify and supporting the glands that produce growth factors to heal the hypothalamus.